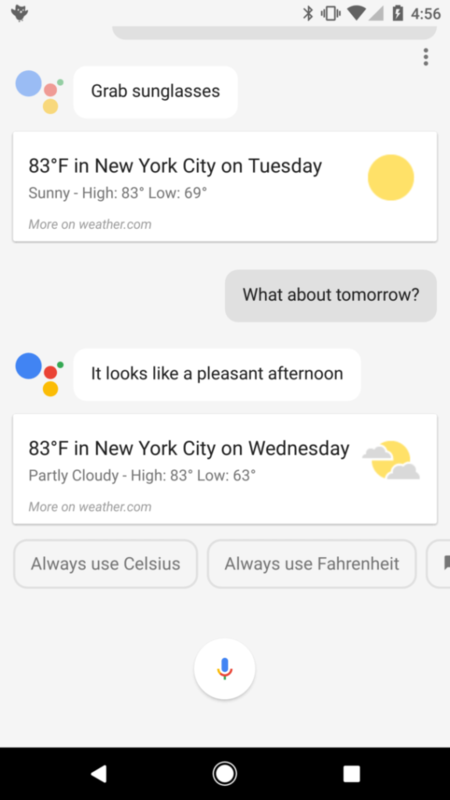 To invoke Google Assistant, you can either use “OK Google,” as you can today to trigger a voice command or search query, or you touch the microphone icon or or one of the “follow-up” buttons (image below). My greatest frustration was that each command or query had to be separately initiated. Putting the buttons aside, users need to touch the mic or say “OK Google” again before each new search or follow-up. And while the Assistant understands pronouns and context, you can’t have the kind of multi-step interaction with the Assistant I had hoped. I wanted to just keep talking, without these “manual” search interactions. To be clear, however, my criticisms come from very high expectations. If your first experience with voice search were to be the Google Assistant on the Pixel, you’d be impressed and very pleased, I suspect. With Amazon’s Alex that so many voice queries are “answered” with web links. This won’t be a problem for most people (especially SEOs), but I wanted voice answers and more cards, rather than links to websites. I found myself disappointed when Google pushed links. 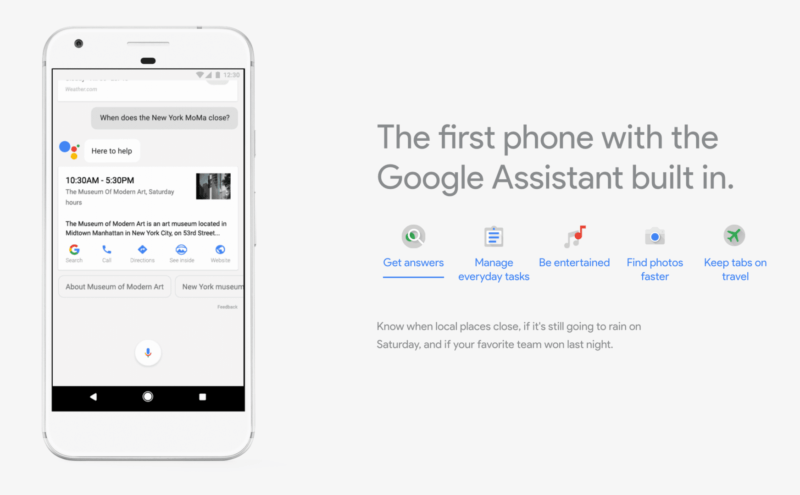 While it will become more interactive over time, right now Google Assistant isn’t much different from the voice search/command experiences you’re already used to on Android phones. In the coming days and weeks, we’re going to see a bunch of “Google Assistant vs. Siri” articles. 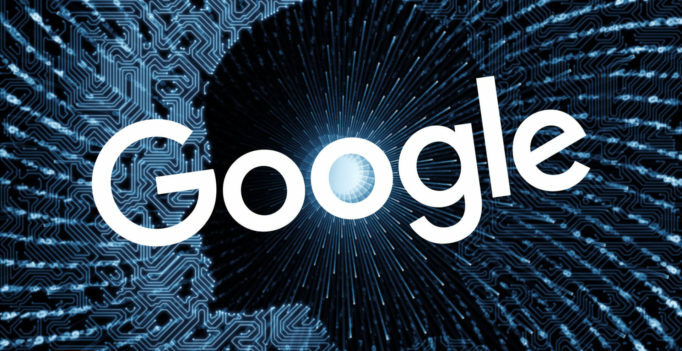 Generally, Google Assistant can do more and offers more functionality because of Google’s search index. Yet there are some things that Siri can do (right now) that Google Assistant cannot. Siri has some third-party integrations that Google Assistant doesn’t yet have. Those will come to Google Asssistant. 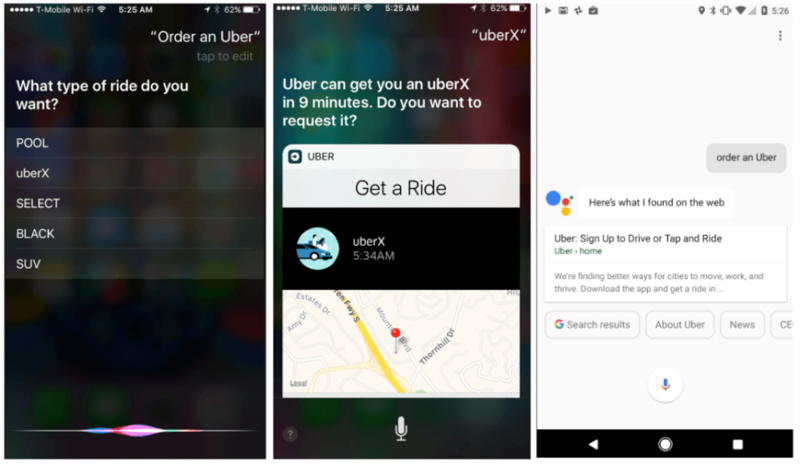 For example, you can order Uber or Lyft using Siri right now, whereas you cannot with Google Assistant. Again, my criticisms of Google Assistant mostly come from high expectations and wanting it to do more and be less a speech-to-text voice search tool. One can start to see how Google Assistant over time will become a doorway or gateway (just like Google search on the web) for everything on Android phones. There are some dramatic implications for content discovery and SEO, which is what we’ve been talking about in the various articles and SMX sessions on voice search and content optimization. We’ll explore those more in the future. What’s fascinating here with Google Assistant on the Pixel (less so with Allo) is that you can really see the transition from more traditional “search” to a next-generation capability that is much more comprehensive, intuitive and interactive. Bring it. The new Google mobile algorithm has arrived in all its fury, and everyone seems a little disappointed in the change that failed to rival Panda….